iPad appears to have crashed - how can I find out what happened? If the app appears to have crashed to the Home screen, you can send us the device’s crash logs to investigate further. Connect the device to your computer with the standard white USB cable that came with your device. Open iTunes (if it has not already opened automatically). Click the ‘iPad’ or ‘iPhone’ button in the top right corner of the screen, which will take you to the summary page for the device. This page shows the device’s name beside the device picture at the top right of the screen. Once the device name has been noted, click the sync button in the bottom right to sync the crash logs. Find the ‘Go to folder...’ option by either selecting the ‘Go’ menu at the top of the screen and then ‘Go to folder..’ or by using the keyboard shortcut (shift-command-G). Copy and paste ~/Library/Logs/CrashReporter/MobileDevice into the field and click the ‘Go’ button, which will open a Finder window with logs from every device that has been synced with your computer. Open the sub-folder whose name matches that of your iOS device. 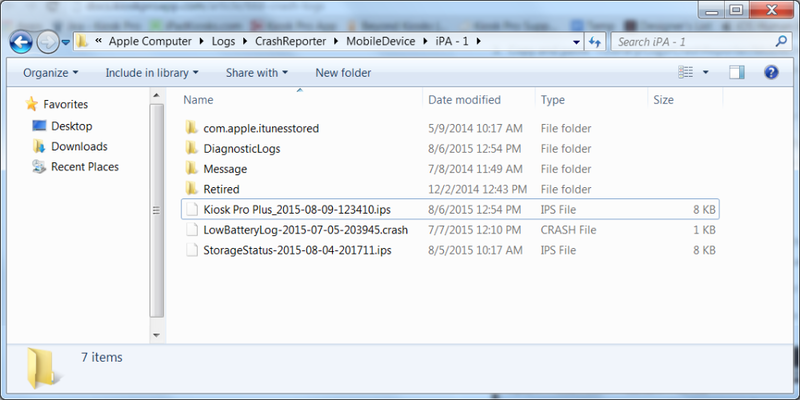 Find any crash logs that have "Kiosk Pro", "JetsamEvents" or "LowBatteryLog" in the filename or just zip the entire folder and attach to an email to us at support@kioskproapp.com. Open a new Window Explorer panel either by clicking the ‘Start’ menu and then ‘Computer’ or by pressing the "Windows" key and the "e" key at the same time on your keyboard. Focus on the bar showing the current folder location at the top of the window by clicking in it. Copy and paste %HOMEPATH%\Application Data\Apple Computer\Logs\CrashReporter\MobileDevice into the field and hit the ‘Enter’ key on your keyboard. Open a new Window Explorer panel either by clicking the ‘Start’ menu and then ‘My Computer’ or by pressing the "Windows" key and the "e" key at the same time on your keyboard. Copy and paste %HOMEPATH%\AppData\Roaming\Apple Computer\Logs\CrashReporter\MobileDevice into the field and hit the ‘Enter’ key on your keyboard. Actual crashing of the iOS operating system itself is relatively rare, but does occur - these logs are often shown as 'JetsamEvents'. We also often hear about situations where power to the device is interrupted and the battery drains to 0, effectively shutting off the iPad. Crashes caused by low battery are also logged in the same folder and are generally identifiable by a ‘LowBatteryLog’ filename. Kiosk Pro disables Auto-Lock automatically as visitors are more likely to approach a kiosk that appears to be on. Our Plus version has a setting that allows you to enable Auto-Lock, though this setting uses the time period set in iOS Settings (General > Auto-Lock). If this time is set to 'Never', the device should not be sleeping. Low battery - if the device's battery is dead and it's not plugged in, it will shut down. Does your device have a regular power supply or is it without power at times? We'd also recommend ruling out a problem with your power supply by testing with a different power supply, preferably one made by Apple. Overheating - if the enclosure you are using does not have adequate ventilation or if the iPad is in direct sunlight for an extended period, the device may overheat and shut down automatically to prevent further damage. Magnetic key - the iPad 2 and above are designed to work with smart covers that use magnets to lock and unlock the device. It might be possible for a kiosk casing or a visitor to enable this. This can be turned off under iOS Settings > General > Lock/Unlock and will only be shown if your device has been used with a smart cover at some point in the past. Someone with access to the Power Button - some kiosks have microchannels that allow you to access this button even if the device is in an enclosure. Pressing it will put the device to sleep regardless of iOS settings. App crash - although if you have 'Auto-Lock' set to never, this should leave you on the Home screen, not in a sleep state. It might be worth looking at the device crash logs to see if there is any issue there.